Maurice Simba has taken another step towards his dream of playing professional football. 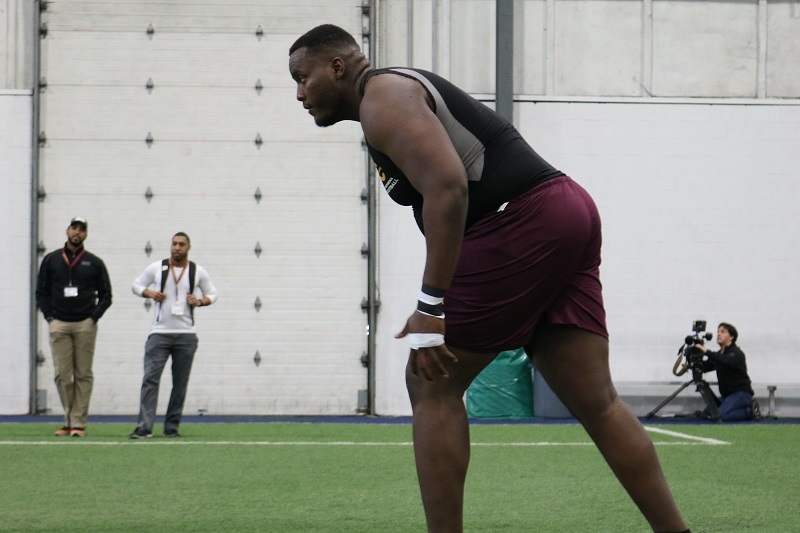 The Stingers’s offensive lineman held a pro day for NFL scouts at the Catalogna Soccerplexe in Lachine on March 12. Simba’s 6’8” frame is taller than the average NFL lineman. Photo by Nicholas Di Giovanni. Scouts from the San Francisco 49ers, Cleveland Browns, Green Bay Packers, Chicago Bears, and New York Jets tested Simba through various drills. He bench pressed 25 reps of 225 pounds, had a 19-inch vertical jump, a broad jump of six feet, 11 inches, and ran his 40-yard dash in 5.99 seconds. The lineman just finished his fourth season with the Stingers, and has been attracting scouts throughout the year. The CFL ranked Simba as the 18th-best Canadian prospect, and fifth-best offensive lineman in their September 2018 list. They ranked him 11th on their prospects list in December 2018 for the draft in May. Scouts from the Pittsburgh Steelers and Kansas City Chiefs attended several Stingers games this past season. In January, Simba played in the NFLPA Collegiate Bowl in California alongside some of the best American prospects. Simba’s journey to become a football player is quite impressive. Born in Kinshasa, in the Democratic Republic of Congo, Simba moved to Quebec at 18 years old to rejoin his mother, who left home when he was three. The 24-year-old barely knew what American football was when he came here, but has been playing for six years. Simba normally played left tackle this season, but admits he would be able to play anywhere along the offensive line if asked. The scouts had him do drills for both the left and right tackle positions. Simba ran the shuttle run drill in 5.76 seconds. Photo by Nicholas Di Giovanni. A scout from the Kansas City Chiefs visited Montreal in the fall, and that team isn’t shy about drafting Canadian linemen. They drafted Laurent Duvernay-Tardif in the sixth round of the 2014 draft, where he’s been their starting guard since the 2015 season. Duvernay-Tardif is one of 12 Canadians who played in the NFL last season. Main photo by Nicholas Di Giovanni.